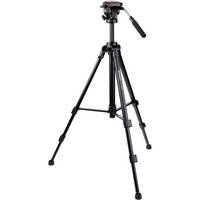 The Magnus VT-300 Video Tripod with Fluid Head is a lightweight and portable tripod system for shooting stable videos with DSLRs, small camcorders, and any other cameras up to 15 lb. A built-in fluid effect video head pans a full 360°, tilts up and down, and features independent pan and tilt locks for fixed-position shots. A pan bar and a snap-in quick-release camera plate are included. The quick-release plate features a 1/4" camera mounting screw, a registration pin, and an anti-skid mounting surface. A center-column raises or lowers at the turn of a hand crank to let you fine-tune a height without adjusting the tripod legs. A mid-level spreader keeps the legs steady when you adjust the tripod, and it locks to keep the legs secure once you've set the tripod in position. Both the center-column and spreader are integrated. The maximum height of the tripod with the center-column raised is 64.3". The tripod legs extend at two leg stages at the release of flip-locks. The legs feature replaceable rubber feet that provide grip on hard or slippery surfaces. An internal bubble level will help you position the tripod evenly on uneven ground. A carry case with a shoulder strap is included and will let you conveniently carry the tripod over your shoulder when you're travelling about.